Sometimes it just happens. You're in a room with a book, working away, and then suddenly it just gets up from the table and leaves, straight out into the night, without even closing the door. That's when you realize you're in a wheelchair, there is a steep flight of stairs down to the ground, the rain is lashing and the streets lights are out. Oh, and there is no phone. 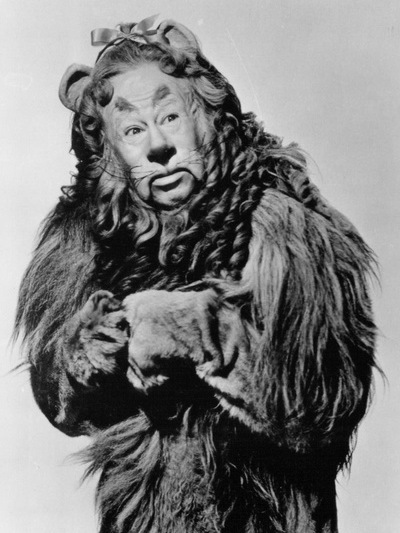 I'd been thinking about courage and, without considering very carefully, I'd taken as my model the Cowardly Lion from the Wizard of Oz - at the early part of the movie, when he's looking for "the Nerve", as if it were a thing that you can acquire or lose. And then, trawling for something else, I came across the quote from C.S. Lewis, where he says it is not a discrete thing at all. Courage doesn't exist in a vacuum, or even on a separate shelf in the cupboard where you store your virtues. So I don't need to be brave to push myself down the steps without a ramp or a raincoat. In the midst of doing something else, that's where I'll discover bravery. Which is pretty much the message in Wizard of Oz, at the end where it goes all sanctimonious and embarrassing. After the really, really scary monkeys. If Not There, Then Where? Come join the celebrations over on An Awfully Big Blog Adventure today - it's our 5th Birthday! The new Children's Laureate, Malorie Blackman, is kicking things off, and there will be frolicking all day! Huzzah x Five and pass the cake! Another challenge/delight from 26 - this round of Throwaway Lines has been edited by Malcolm Blythe. What happens is, writers are sent a random bit of rubbish - a thrownaway scrap of paper - and told to write a story. Here is my story - They Do It with Mirrors. And there are plenty more - enjoy!